English Paper Piecing (EPP) is a traditional method of hand piecing where paper templates are used inside the block elements to guide where the edges are turned under. Traditionally the turned under edges were basted with needle and thread. We will learn this method and the glue method. I will also show you two different ways to stitch your pieces together. You can choose which works best for you! Lucy Boston “Patchwork of the Crosses” is a quilt pattern that uses the EPP technique with a special “twist”. The “twist” is that the pieces are fussy cut to create patterns within the block much like a Kaleidoscope looks when you turn it. You can use any fabric pattern you like – civil war, modern, ombre, solids, batiks, small prints and large prints. You are only constrained by your imagination. We will work together to help you see the patterns that you can create using the motifs within your fabrics. 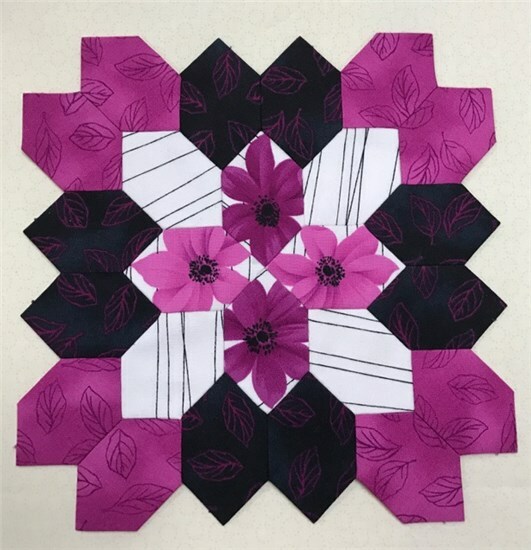 We will be starting an EPP Block of the Month in April/May, and Catherine will be incorporating instruction for this BOM into her monthly EPP class for anyone who is interested.